gardens, these species are showing their appreciation of a good soaking. Elsewhere, daisies, daffodils, irises and other blooms are showing all around the grounds. To top it off, Upper Noe’s custom birdhouses that had come down for the winter are returning with fresh colors. 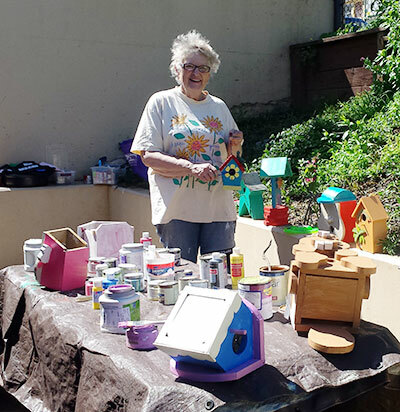 Joan and her crew of Ladybug Gardeners recently spent a sunny Saturday morning putting fresh paint on the repaired and primed avian abodes. Our little helpers and families joined in to add their artistic flair. Look for these eye-catching art pieces throughout the park, sometimes in the least expected locations. 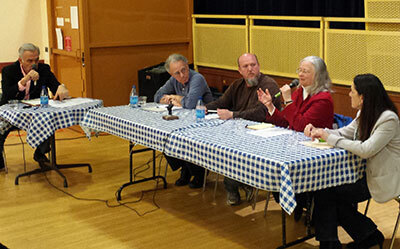 Former mayor Art Agnos moderated a panel of local community association leaders at the March meeting of Upper Noe Neighbors at the Rec Center. Art gave a grand introduction, emphasizing the importance of neighborhood associations. He noted the unique situation Upper Noe Neighbors created by bringing together adjacent associations into one forum. About 40 people attended. Art mentioned that this was typical of these types of meetings where the vanguard of the community comes together to spotlight issues and to gather and exchange information to disseminate to their neighbors. 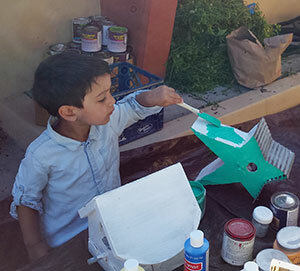 Art went on at length about the power of neighborhood associations and the need for them to exercise that muscle to overcome the centralized power of City Hall. He championed neighborhoods with making the difference in the 8 Washington and Prop B (waterfront construction height limits) initiatives. 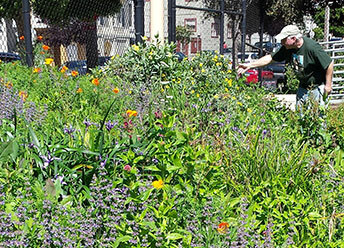 The panelists included GPA President Michael Rice, Friends of Noe Valley President Todd David, Diamond Heights Community Association President Betsy Eddy, and Upper Noe Neighbors President Marianne Hampton. He asked each to introduce themselves, tell how long they have lived in their neighborhoods, how they came to be involved in their neighborhood association and for how long. Each had an interesting story to share that illuminated their long and deep-seated connections to their communities and protracted histories of tackling neighborhood issues. When the floor was open to questions, someone mentioned tech shuttles. SFMTA just announced plans to designate two whole blocks of Dolores Street near 29th Street as new tech shuttle stops despite a large stop at Dolores and San Jose Ave two blocks away. Ed Mason of UNN, an expert on the subject, spoke at length. A study of the available records shows that less than 8500 people in San Francisco use tech shuttles. He proposed that Millbrae Station can easily accommodate a large number of buses and that workers can get there by taking BART. Ron Halbert of the new Fairmount Heights Association asked the panelists how they stimulate participation. Ron mentioned that since forming the group last summer, monthly attendance steadily dropped as the initial excitement waned. All of the panelists agreed that maintaining active member participation is a perennial struggle, and that a small, core group generally serves to maintain the association. All agreed however, that neighborhood associations are important community assets. The panelist also voiced sentiments that bringing associations together in forums such as this is a great idea and should be repeated on a regular basis. 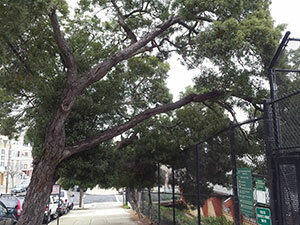 The low hanging branches over the sidewalk on Sanchez Street finally presented enough of a danger to demand action. The large limbs not only cast a shadowy gloom over the sidewalk but also threatened to take out the fence. Despite discussion over the years about the hazard, the danger did not gain any traction. Concerns were that nature would take its catastrophic course during a major storm. All that melted away when inspectors suddenly roped off the sidewalk with caution tape. Rec & Park crews were on the scene within days. Remember to report conditions that concern you to 311 or to the Rec Center office. Patience and persistence won out. Stroll by and experience the sunny difference. Dolores shuttle stops, June ballot initiatives.